A collection of three stories. 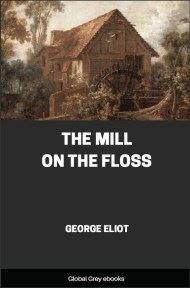 The Stories take place in and around the fictional town of Milby in the English Midlands. 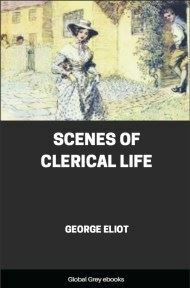 Each of the Scenes concerns a different Anglican clergyman, but is not necessarily centred upon him. 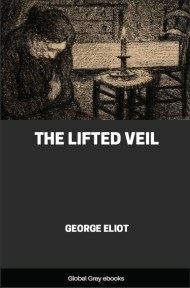 Eliot examines, among other things, the effects of religious reform and the tension between the Established and the Dissenting Churches on the clergymen and their congregations, and draws attention to various social issues, such as poverty, alcoholism, and domestic violence. It was very warm everywhere that evening, but especially in the bar of the Red Lion at Milby, where Mr. Dempster was seated mixing his third glass of brandy-and-water. 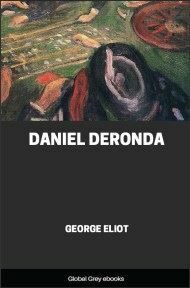 He was a tall and rather massive man, and the front half of his large surface was so well dredged' with snuff, that the cat, having inadvertently come near him, had been seized with a severe fit of sneezing—an accident which, being cruelly misunderstood, had caused her to be driven contumeliously from the bar. 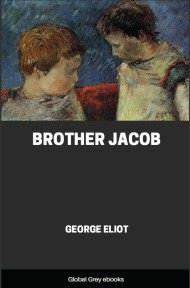 Mr. Dempster habitually held his chin tucked in, and his head hanging forward, weighed down, perhaps, by a preponderant occiput and a bulging forehead, between which his closely-clipped coronal surface lay like a flat and new-mown table-land. The only other observable features were puffy cheeks and a protruding yet lipless mouth. Of his nose I can only say that it was snuffy; and as Mr. Dempster was never caught in the act of looking at anything in particular, it would have been difficult to swear to the colour of his eyes. 'No, no, Dempster,' said Mr. Luke Byles, 'you're out there. 'Come, Byles, that seems a deal more likely,' said Mr. Tomlinson, in a conciliatory tone, apparently of opinion that history was a process of ingenious guessing. 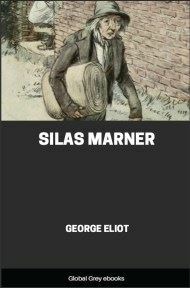 A loud and general laugh, with 'You'd better let him alone Byles'; 'You'll not get the better of Dempster in a hurry', drowned the retort of the too well-informed Mr. Byles, who, white with rage, rose and walked out of the bar. 'And how do you get on with your signatures?' said Mr. Pilgrim, the doctor, who had presented his large top-booted person within the bar while Mr. Dempster was speaking. Mr. Pilgrim had just returned from one of his long day's rounds among the farm-houses, in the course of which he had sat down to two hearty meals that might have been mistaken for dinners if he had not declared them to be 'snaps'; and as each snap had been followed by a few glasses of 'mixture'; containing a less liberal proportion of water than the articles he himself labelled with that broadly generic name, he was in that condition which his groom indicated with poetic ambiguity by saying that 'master had been in the sunshine'. 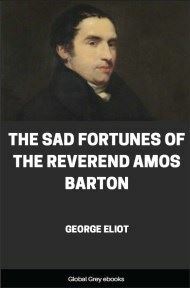 Under these circumstances, after a hard day, in which he had really had no regular meal, it seemed a natural relaxation to step into the bar of the Red Lion, where, as it was Saturday evening, he should be sure to find Dempster, and hear the latest news about the protest against the evening lecture.